"Having a big buffet-style dinner and eating way too much food! It's all about family and friends." HI MY NAME IS MALAYA. I AM A 14 YEAR OLD GIRL WHO ABSOLUTLY ADMIRES YOU. JUST TO TELL YOU I AM AFRICAN AMERICAN AND JAPANESE JUST LIKE YOU LOL. MY MOTHER IS JAPANESE AND BORN IN JAPAN AND MY DAD IS BLACK. ANYWAYS, HOPEFULLY I CAN BE A BEAUTIFUL MODEL JUST LIKE YOU ONE DAY AND MODEL FOR YOUR COMPANY. So how does Iraqi-Grecian-American model Gina prepare to step out? "Baby Phat. 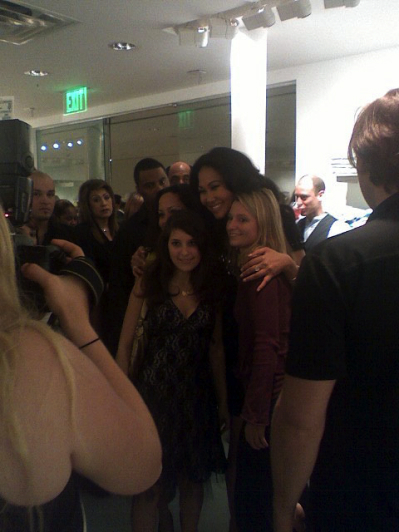 Kimora Lee Simmons is a great designer and a beautiful woman that makes other women feel just as beautiful wearing her clothing design," Gina says. "Bebe, another clothing design that I enjoy wearing. The clothes to me represent class, which describes me well. My makeup brand would be Revlon, Landis and MAC. My favorite perfumes, I have plenty. Two that I love are Giorgio Armani and Gucci." Can you identifity the real thing? Clues to a Baby Phat fake can include stitching that lacks details, an atypical finish, and missing nameplates or leather accents. Hangtags may be flimsier, with words that are printed, not embossed. Jeans are a favorite target of counterfeiters. Other jeans may be missing logos or have loose threads. The pajamas, books, and T-shirts I understand, but Hello Kitty bowling balls, bicycle tires, and Fender Stratocasters? Add the estimated 50,000 to 100,000+ other items bearing the Hello Kitty logo that have been marketed in the US alone, and the idea of collecting the cute feline can be overwhelming. Since Hello Kitty's "birth" in 1974, the brand has become a worldwide marketing phenomenon, appealing not just to children, but to adults as well. 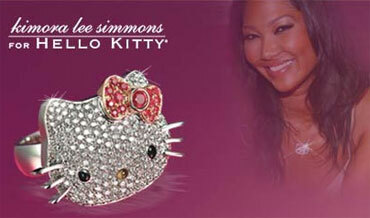 Sanrio, the Japanese company that owns Hello Kitty, offers a line of designer merchandise just for grownups. There are cashmere sweaters, perfumes, and diamond watches and jewelry among the sundry goods offered online and at boutiques around the globe. A diamond ring and a pair of diamond earrings designed by Kimora Lee Simmons will cost you $1950 and $2150 respectively, while watches bearing the feline's visage can run from $995 to $3450, and more.